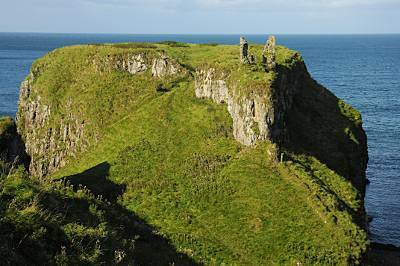 The village of Dunseverick is a small community of houses that is approximately 700m to the South East of the Causeway Coast Way at Dunseverick Castle. There are no facilities of any kind available to the walker in the village. Dunseverick Castle itself is a crumbling ruin and has no attached visitor centre or associated amenities. Dunseverick Castle is thought to have been built in the 5th Century. It was once the seat for King of Dalriada, which was a kingdom that consisted of most of Antrim and part of Scotland. Dunseverick was also at the end of one of the roads that led to the Hill of Tara, from where the High King of Ireland ruled. The Castle was destroyed in the 1650's by General Robert Munro and Cromwell's Army. In more recent years the property was bequeathed to the National Trust by a local farmer.